Wedding Invitation Template "Spring Vines", Peach. DIY Floral Wedding Invites. Printable Nature Wedding Invitations. Digital Download, Word. Nature wedding invitation template "Spring Vines" with floral ornaments, peach color. DIY printable wedding invites - affordable and easy to use. Simply download the template file after purchase and edit your text in Microsoft Word. Print as many as you wish and cut to trim marks. Change ALL the wording and use for whatever occasion you need! *The template has a white background. For the look on the pictures print on ivory or cream color card stock. *This item is a digital file, no physical item will be mailed to you. The envelope is just a suggestion for color combination and it is not included in the template. Contact me for more coordinating templates or custom colors. *Please note that you can not change the color of the artwork and size of the template. Please contact me if you'd like a color change or size change service prior to making a purchase. *Some of my templates have backgrounds as part of my display. The background is not part of your template purchase. 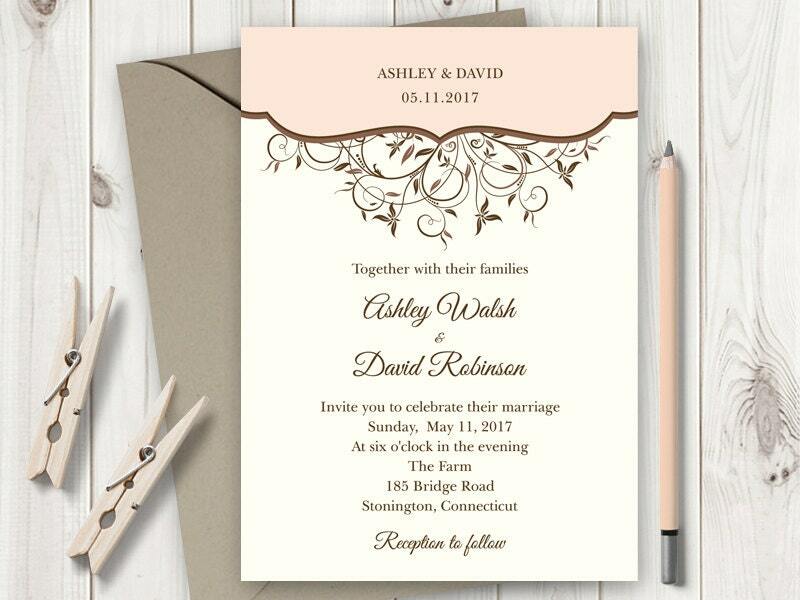 DIY Printable Wedding Invitation Set "Spring Vines", Peach Color. Wedding Templates - Invite, RSVP, Thank You Card. Instant Download, Word. Wedding Program Template "Spring Vines", Peach. DIY Printable Program, Folded Booklet. Editable Text, MS Word. Instant Download. Red Roses Wedding Invitation Printable Template "Classic Roses", Burgundy Red. DIY Wedding Invites. MS Word Template, Digital Download. Watercolor Wedding Invitation Template "Summer Flowers", Orange. Rustic Wedding Invites. DIY Floral Printable Invitation. Instant Download. Printable Wedding Invitation Template "Elegance" with Ornaments in Antique / Old Gold Color. DIY Wedding Invites. Instant Download, MS Word. Wedding Invitation Template "Cathedral Ornaments" in Plum Purple Color. DIY Printable Wedding Invites. Digital Download, MS Word Template. Watercolor Wreath Wedding Thank You Card "Lovely Leaves", Teal. DIY Printable Thank You Note Template. Editable MS Word, Instant Download. Sakura Menu Template. DIY Menu "Cherry Blossom", Pink. Spring Wedding Menu Templates. Printable Tea Lenght Menu Cards. Japanese Style. PERFECT😍 couldn’t have asked for anything better! Sunflower Wedding Invitation Printable Template with Burgundy Red Stripes. Vintage Rustic DIY Invite. Editable Text, Word. Instant Download. Colors may not print exactly as they appear on your screen. If you'd like to try a free sample of the template before making a purchase, please send me a message and leave your e-mail. In my designs I use both free fonts and fonts that are licensed for this use. Links to all suggested fonts are included in the instructions, if they are not default Microsoft Word fonts. You can also use any other font you wish. If you are taking your template to a copy shop or decide to use an online printing service, please check with them if they take a Microsoft Word .doc files first. Please check with them also if they require a copyright release to print your templates. I will be happy to provide it for you. All of my wedding templates are for your personal use only. Please see my Policies section for the complete information on license and copyright. Watercolor Invitation Template "Summer Flowers", Pink. Rustic Wedding Invites. DIY Floral Printable Invitation. MS Word, Instant Download. Elegant Wedding Invitation Printable Template "Cathedral" with Ornaments in Navy Blue. DIY Wedding Invites. Instant Download, MS Word. Watercolor Wedding Invitation Template "Delicate Feathers". Printable Wedding Invites, Blue and Pink Watercolor. Instant Download, MS Word. Spring Wedding Invitation Printable Template "Leafy Branch" in Hot Pink & Olive Green. DIY Outdoor Nature Wedding Invite. Instant Download. Beach Wedding Invitations Printable Template "Hawaii" - Turquoise. DIY Destination Wedding Invites with Hibiscus Flower. Instant Download. Rustic Wedding Invitation Template "Wildflower Bunch", Navy Blue. DIY Floral Printable Invites. Editable Text, MS Word. Instant Download. DIY Destination Wedding Invitation Template "Hawaii" Peach. Printable Beach Wedding Invites with Hibiscus Flower. Instant Download.